Hi! Happy Sunday to everyone! 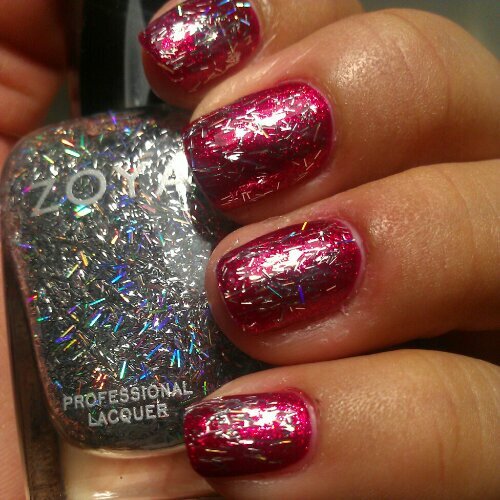 Today I will be reviewing Zoya’s 2012 Winter Collection, Ornate Collection. This is the best collection I own from them! 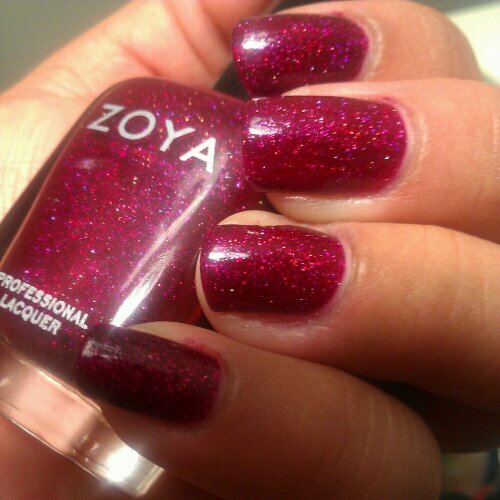 Actually I like all the polishes from Zoya, but this is in my top favorites! The collection consists of 6 polishes: 3 holo dust, 2 shimmer, and 1 bar glitter. Each color is stunning!! Let’s get to the swatches now! 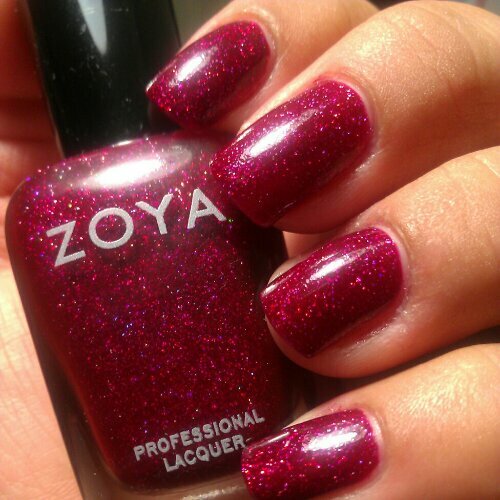 Blaze is a red/berry color with the most beautiful holographic I’ve seen in a nail polish! Amazing! In the sun, It’s even more beautiful! 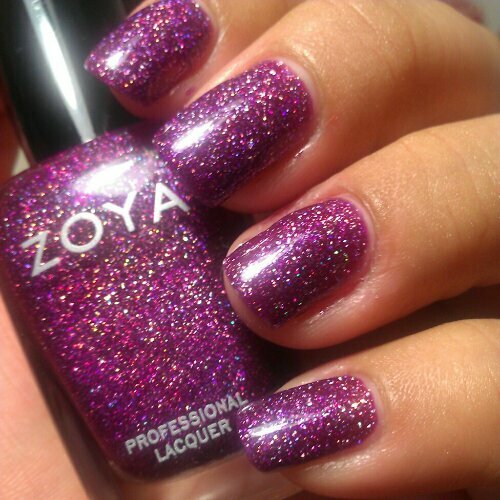 Aurora, is a purple holo amazingness in a bottle! 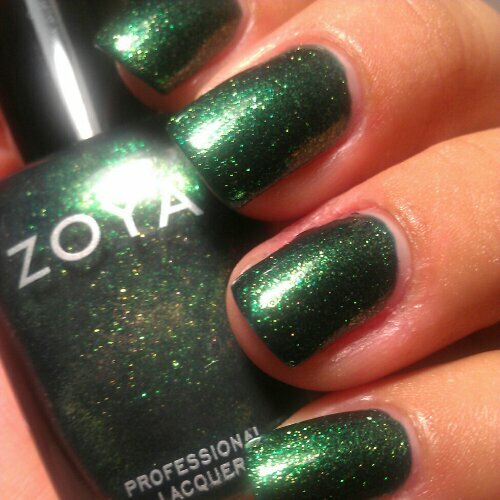 Words cannot describe this amazing polish! The holographic dust stands out in any lighting! The sun will blind you if you stare at your nails outside! Just kidding! But It’s a gorgeous color! The holo is the best thing ever! If I said alot about Aurora, Storm would take a whole post! But just to summarize it, this is my absolute favorite from this collection! Enough said and enough seen. 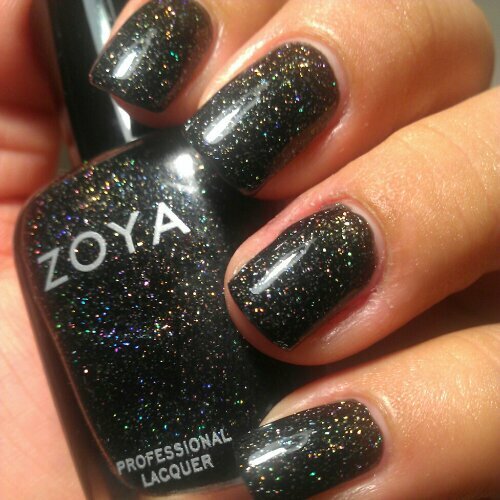 Best black nail polish I have ever worn! Now on to the shimmer polishes from this amazing collection. 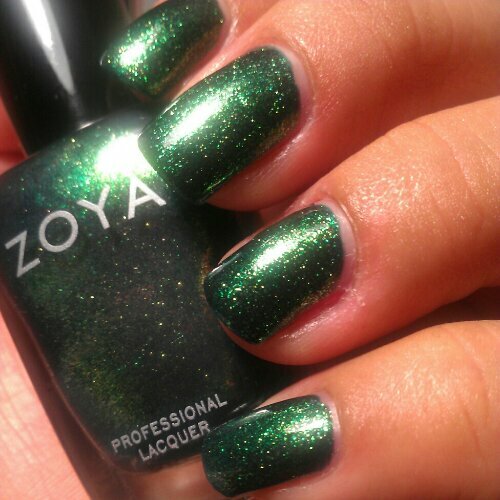 Above we have Logan, which is a green with goldish shimmer! Holiday all the way!! 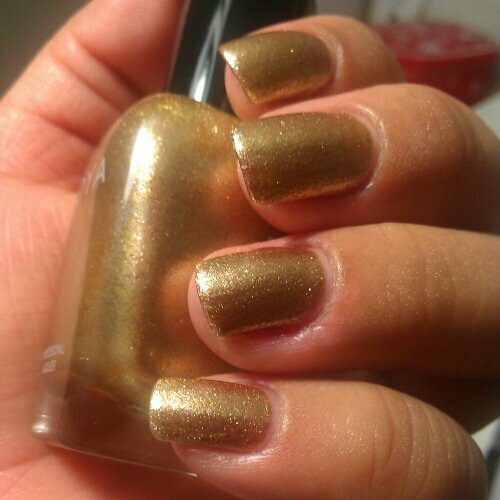 Ziv, is a gold shimmer polish with sort of copper/gold specks in it! In person it is stunning! This was my second favorite because it is like a hidden gem. 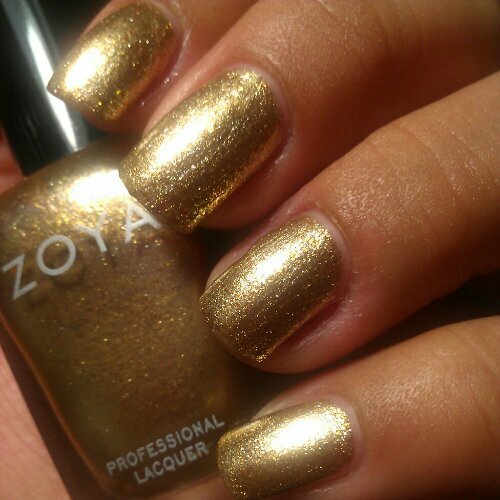 In the bottle it looked like a regular gold shimmer, but then I applied it and discovered its hidden beauty! LOVE IT! 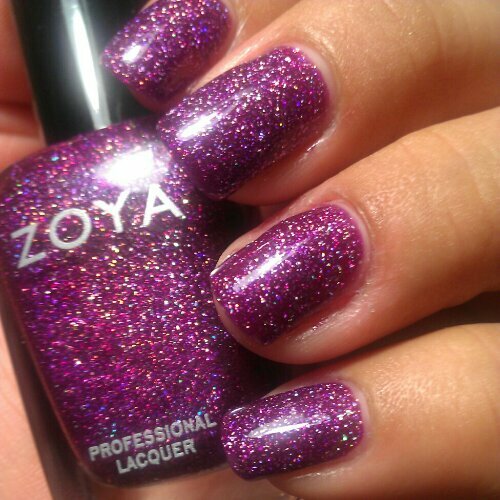 Electra is the glitter topper for the holidays! Put it over any color and the party is on!! Above it is swatched over OPI You Only Live Twice. One coat covered my nail. 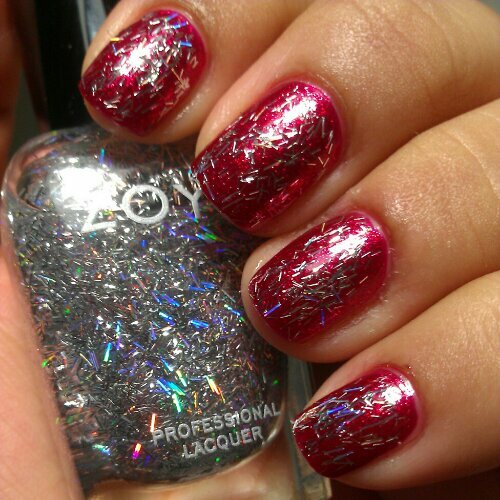 The silver bar glitter makes any look festive. Looks great over any color! All the swatches with the exception of Electra are two coats. This collection was the collection for me! The collection of the year, at least in my book 🙂 what did you think? Let me know in the comments! Hope you enjoyed reading and viewing! Have any questions, or comments? Leave them in the comments! ***These polishes were purchased by me. 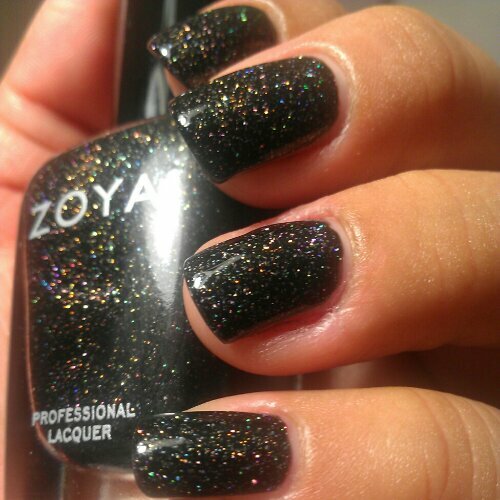 This entry was posted in Collections, Zoya and tagged Glitter, Gold, Green, Holographic, Purple, Red, Silver, Zoya. Bookmark the permalink.